The price of gold has see-sawed since the Federal Reserve raised interest rates on Dec. 16, and market experts debate if the action is good or bad for gold. Rob Chang of Cantor Fitzgerald Canada believes that after the small rate hike doomsayers are overstating their case and that gold should sell in 2016 for about $100/oz more than today. In this interview withThe Gold Report, he argues that in today’s climate cash costs below $1,000/oz are the bare minimum requirement for survival. Happily, Chang highlights three gold producers and one silver producer that have what it takes. The Gold Report: Some say the price of gold has for some time been suppressed by fear of a Federal Reserve rate hike. What do you think? Rob Chang: Now that the Fed has finally raised the rate by a small amount at its December meeting as we expected, we will see a continued sideways trend for gold. TGR: It has been suggested that the Fed has been exceedingly reluctant to raise rates because of fears that would kill the economic recovery and blow up the deficit. RC: I agree absolutely. Raising rates is likely a bad idea, especially raising them significantly. The key question is whether the Fed will continue to raise rates, and if so, by how much. Higher rates cause issues across the board, issues that frankly I don’t believe the U.S. economy can handle. TGR: Given the lack of a robust economic recovery since 2008, and the ever-increasing geopolitical instability throughout the world, the latest being a possible war between Turkey and Russia, are you surprised that gold has continued to fall rather than stabilize or rise? RC: Yes. Given the geopolitical tensions you mentioned, one would expect the gold price to go up. To be honest, I don’t know why it hasn’t. I can only point to recent good U.S. economic news and the potential interest-rate increases as the reasons. TGR: Goldman Sachs predicted Nov. 19 that gold will fall to $1,000 per ounce ($1,000/oz) over the next 12 months. What are your predictions for the prices of gold and silver? RC: For gold: $1,173/oz for 2016, $1,185/oz for 2017, $1,200/oz for 2018 and $1,250/oz by 2020. For silver: $15.69/oz for 2016, $17/oz for 2017, $18/oz for 2018 and then $19/oz long term. TGR: We’ve seen that producers are already walking a tightrope. To give a recent example, Rubicon Minerals Corp. (RBY:NYSE.MKT; RMX:TSX) ran into geological problems at its Phoenix Lake project in Ontario, and suddenly the future of the company was in doubt. At $1,050/oz gold, would you expect a perhaps final wave of consolidations? RC: I certainly think that we’re due, and I’m a little surprised we haven’t seen more mergers and acquisitions already. Producers that do have cash would be well served to cherry pick among the many companies trading at extremely low valuations. TGR: What are the attributes of the producers that will survive at $1,050/oz gold? RC: First, all-in sustaining costs (AISC) such that they can at least tread water for the time being. Second, management teams that will resist the temptation to buy cheap companies simply because they can. Third, projects in safe jurisdictions. At Cantor, we look for companies in world-class areas such as the Carlin and Battle Mountain trends or Red Lake: places where you don’t worry that you’ll wake up one morning to find your asset nationalized. TGR: A bunch of juniors with late-stage development projects have been treading water for years in the hope the gold price will rise. If it doesn’t, will these companies drown? RC: Some will; others will be acquired by midtier producers. There are some companies that have good access to capital and have been very opportunistic in picking off companies or their assets at good prices. TGR: Gold producers outside the United States, such as Canada, Australia, Brazil, Russia, are currently enjoying a tremendous dollar premium. How much of a leg up does this give them over U.S. gold producers? RC: It’s pretty significant, and the premium has increased by over 20% over the past year. With the direction the U.S. Fed is going, and the associated strength in the U.S. dollar because of it, this premium has a good chance of getting even better. TGR: Will we see mining capital flow out of the U.S. and into those four gold-producing countries? RC: That would certainly make sense. All things being equal, of course. But at the end of the day, a fantastic asset will always attract investment dollars no matter the macro environment. TGR: You make frequent visits to mining sites. What are the qualities you look for on site? RC: I try to see the things management is trying not to show: the corners, the cracks, how the workers are interacting, the condition of the machines, how clean certain areas should be relative to what they are. I try to discover the actual conditions on site, and you can get that only from good conversations with the employees. I look also for good infrastructure and for a sense of how projects are perceived by area residents. If community relations are poor, that could really sidetrack a mine no matter how good the other metrics are. TGR: What have you learned from your recent visits to Mexico? RC: Every company operating there says that its locations are safe, that the problems with the drug cartels are not there but in other locations in other states. That can’t always be true. That typical response has become something of a challenge, and we are working out the best way of getting a better handle on it. TGR: What is it about Nevada you like so much? RC: As they say, when you want to find a mine, the best place to look is in the shadow of a head frame. Nevada is the home of many world-class mines. It has the Carlin and Battle Mountain trends. It is easier to find elephants there because Nevada is where the elephants roam. TGR: Which Nevada gold companies are your particular favorites? RC: Let’s start with Pershing Gold Corp. (PGLC:NASDAQ). It has the past-producing Relief Canyon mine, which has 809,000 ounces (809 Koz) gold Measured, Indicated and Inferred. The project has a short-term path to production: 6–12 months, once the decision is made. It is fully permitted and will require capital expenditures of only ~$12 million ($12M). In addition, the company has been finding some spectacular gold intercepts just north of the mine, including 9 grams per ton over 14 meters (9 g/t over 14m) and 7.03 g/t over 16m. Pershing’s management actually thinks that it might be hitting a feeder system that could be a source for millions of ounces of gold. Finally, the company has a good management team. Steve Alfers, the CEO, is the former head of U.S. operations for Franco-Nevada Corp. (FNV:TSX; FNV:NYSE). He left Franco to join Pershing, which speaks to how highly he values it. Alfers has experience in finding assets, including Long Canyon, which was sold to Fronteer Gold. His permitting people are quite strong. This is a solid company from top to bottom. TGR: What’s your opinion of the Relief Canyon internal cost estimates published Nov. 19? RC: What’s significant is the AISC of less than $800/oz. If this number holds, Relief Canyon will make money pretty easily, even at $1,050/oz gold. We are currently more conservative and are forecasting AISC to average $866/oz for Relief Canyon—more conservative, but still economic in the current gold price environment. TGR: This Nov. 19 estimate does not include the latest assay results, correct? RC: No, it does not. Given how good these results are and that the company continues to drill, it could potentially add many more ounces and improve the economics further still. TGR: How does Pershing stand for cash? RC: It’s in a fairly good position with about $13M now. It will likely need to raise a little more once the production decision is made. TGR: Pershing’s land package was augmented significantly in January with the purchase of land from Newmont Mining Corp. (NEM:NYSE). Could Newmont be a suitor for Relief Canyon? RC: Potentially it could be. Newmont may be waiting to see how much exploration upside there really is at Relief Canyon before it decides to pull the trigger. TGR: How do you rate Pershing? RC: A Buy rating and a 12-month target price of $8.55. TGR: What else do you like in Nevada? RC: Premier Gold Mines Ltd. (PG:TSX). This is one of those companies that has bought good properties at good prices. Its 100%-owned McCoy-Cove project is looking pretty solid, but more important is South Arturo, which we recently visited. Premier owns 40% of this, and Barrick Gold Corp (ABX:TSX; ABX:NYSE) owns 60% and is the operator. South Arturo should go into production in the middle of 2016, and will transition Premier Gold into a producer for the first time in its history. We’re excited because Premier Gold will probably get a multiple expansion as a result. The key thing to note about South Arturo is that there is likely tremendous upside here as Barrick could be keeping its numbers on the project in-house. As far as we know, this project has ~ 440 Koz gold, which speaks to a two-year mine life. Of course, a company such as Barrick wouldn’t spend all this capital just for two years. So we expect a significant increase in ounces underground. In the meantime, Premier should realize $50–60M in cash flow over the first two years from South Arturo. TGR: Besides the properties listed above, Premier has three others in Ontario. Hasaga is 100%-owned, while Trans-Canada Geraldton is a 50/50% joint venture (JV) with Centerra Gold Inc. (CG:TSX; CADGF:OTCPK) CADGF:OTCPK) and Rahill-Bonanza at Red Lake is a 44/56% with Goldcorp Inc. (G:TSX; GG:NYSE). Is this JV strategy a good one? RC: It makes a lot of sense in the current environment. Premier has several good assets, but it does not have a history of developing and building mines. Its team is composed of a lot of former executives from Agnico-Eagle Mines Ltd. (AEM:TSX; AEM:NYSE). These people do have the history, but it’s a bonus that the company can get some of the best names in the business, such as Barrick and Goldcorp, to help it out. Premier has its fingers in many pies and has spread the risk to bigger and more experienced companies so that it can devote more attention to its earlier-stage projects. TGR: How do you rate Premier? RC: A Buy rating with a 12-month target price of $4.25. TGR: Which Canadian junior producer do you like? RC: We like Primero Mining Corp. (P:TSX; PPP:NYSE), which produces in Ontario and Mexico. Primero was once a market darling. It got a real kicking for its acquisition of the Black Fox mine in Ontario through its purchase of Brigus Gold. That mine has struggled for quite a bit but what we’ve seen over the last couple of quarters is that it seems management may be turning Black Fox around. It looks to be on the path to becoming an economic mine, as opposed to being a fixer-upper. TGR: What about Primero’s Mexico mine? RC: That would be San Dimas, a world-class mine located on the border of Sinaloa and Durango states, a safe part of Mexico. It had a strong Q3/15, reducing its gold-equivalent AISC there to $454/oz. TGR: What is the company’s overall gold-equivalent AISC? RC: It’s $775/oz for Q3/15. As Black Fox continues to progress, the overall AISC should continue to come down. I really am a little surprised just how fast Black Fox has come along. TGR: How do you rate Primero? RC: A Buy rating with a 12-month target price of $6.80. Right now, it’s trading at $3.19, so we see it doubling. There’s good value there. TGR: What other company do you like in Mexico? RC: Avino Silver & Gold Mines Ltd. (ASM:TSX.V; ASM:NYSE.MKT; GV6:FSE). This is a silver company that has gold. It has two mines: San Gonzalo, which began production in 2012, and the past-producing Avino mine, which began production in January and is ramping up. We expect the San Gonzalo mine to produce ~1.15 Moz silver equivalent (~1.15 Moz Ag eq) annually for several years. We expect Avino to produce 1.5–1.7 Moz Ag eq annually going forward. This company has pretty decent cash costs. We expect long-term AISC for the company to average around $13/oz Ag eq. TGR: How do you rate Avino? RC: A Buy with a target price of $3.10. This is an extremely underfollowed name, so it’s usually a surprise when I mention it to people. TGR: Baron Rothschild supposedly said, “Buy when there is blood in the streets.” Howe Street and Bay Street have seen blood in the streets for years. Is now the time to invest in precious-metals companies? RC: I do think so. Given how few gold miners can make money at $1,050/oz, I struggle to see how gold prices can make a further significant downward move. On the other hand, I see lots of potential for the gold price to move a lot higher. Looking at the relative downside to upside, we can say that gold could possibly move another $100/oz down, but on the upside, if events move in the right way, gold could move up several hundred dollars. TGR: Rob, thank you for your time and your insights. Read Rob Chang’s energy investing ideas here. 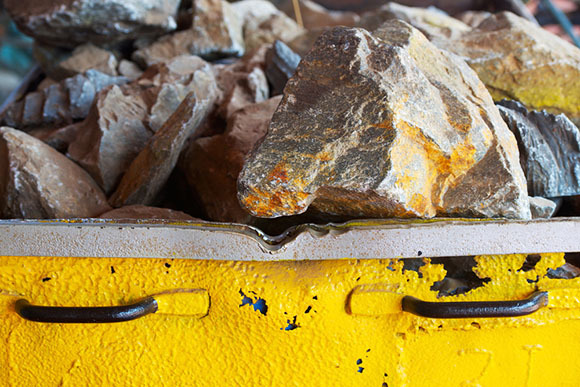 Cantor Fitzgerald Canada’s Senior Analyst, Managing Director and Head of Metals and MiningRob Chang has covered the metals and mining space for over nine years for the sellside and the buyside. Prior to Cantor, Chang served on the equity research teams at Versant Partners, Octagon Capital and BMO Capital Markets. His buyside experience includes managing $3 billion in assets as a director of research/portfolio manager at Middlefield Capital, where his primary resource portfolio outperformed its direct peer and benchmark by over 28% and 18%, respectively. He was also on a five-person multistrategy hedge fund team, where he specialized in equity and derivative investments. He completed his master’s degree in business administration at the University of Toronto’s Rotman School of Management. 1) Kevin Michael Grace conducted this interview for Streetwise Reports LLC, publisher ofThe Gold Report, The Energy Report and The Life Sciences Report, and provides services to Streetwise Reports as an independent contractor. He owns, or his family owns, shares of the following companies mentioned in this interview: None. 2) The following companies mentioned in the interview are sponsors of Streetwise Reports: Pershing Gold Corp. Franco-Nevada Corp. and Goldcorp Inc. are not affiliated with Streetwise Reports. The companies mentioned in this interview were not involved in any aspect of the interview preparation or post-interview editing so the expert could speak independently about the sector. Streetwise Reports does not accept stock in exchange for its services. 3) Rob Chang: Neither I, nor my family has ownership positions in any of the companies mentioned. My company has a financial relationship with the following companies mentioned in this interview: Premier Gold Mines Ltd. and Avino Silver & Gold Mines Ltd. I was not paid by Streetwise Reports for participating in this interview. Comments and opinions expressed are my own comments and opinions. I determined and had final say over which companies would be included in the interview based on my research, understanding of the sector and interview theme. I had the opportunity to review the interview for accuracy as of the date of the interview and am responsible for the content of the interview.